New Golden Hands Wrist Supports. A must have for Yurchenko vaults. 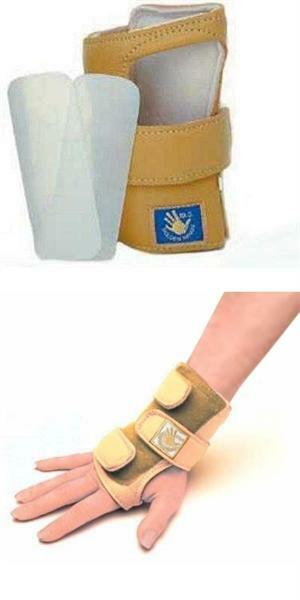 Golden Hands are named after Ten.O's Original Gold colored wrist supports-the Gold Standard of wrist supports. These smooth grain leather gymnastics Wrist supports are a favorite among gymnasts and cheerleaders with serious wrist problems. This wrist support provides several levels of support depending on the type and number of the inserts you use. This variety allows you to lessen the intensity of the restriction of movement as the wrist regains strength. This brace, constructed of butter soft grain leather, consists of three straps that wrap the wrist and hand with a portion of the support crossing the upper palm.